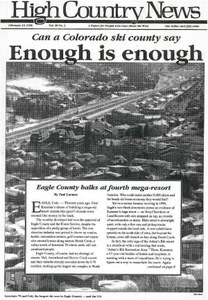 Eagle, Colo., residents wage a 13-year war against developer Fred Kummer's plans to build a mega-ski resort called Adam's Rib. Does the Forest Service love communities as much as it loves ski areas? The cozy relationship between the Forest Service and the ski industry provokes outrage from environmentalists. The new resort town of Mountain Village, Colo., employs questionable legal tactics to allow non-resident property owners to vote while seasonal workers cannot. A report, "Managing Change in Rural Communities," is reviewed. The National Biological Service's book, "Our Living Resources," surveys American ecosystems and species. Activist Yvan Rochon seeks removal of two dams on Washington's Elwha River. A brochure and video called "Abandoned Mines, Stay Out and Stay Alive," seeks to educate people about the dangers of unreclaimed abandoned mines. A National Park Service report, "The Yellowstone Lake Crisis," says there's little hope of ridding Yellowstone Lake of illegally introduced lake trout. Short take, Environmental Action "96: Winning in November, Feb. 24-25. Short take, The Snake River: Balancing the Vision, Feb. 29-March 2. Short take, Seventh North American Interdisciplinary Wilderness Conference, Feb. 29-March 2. 13th National Trails Symposium, March 9-12. C.L. Rawlins changes from poetry editor to editor at large, HCN buffed, corrections, suggestions, birth of Diane Hackl's baby. Colorado's Winter Park Ski Area denies the Forest Service's charge that it packed Little Vasquez Creek with snow and possibly wiped out the stream's cutthroat trout. Evangelical and other Christian environmentalists join together and save The Endangered Species Act, and to prove that not all Christians are represented by the right wing Christian Coalition. Oregon Democrat Ron Wyden wins narrowly over Republican Gordon Smith in the election to replace Sen. Bob Packwood. A controlled week-long flood through the Grand Canyon may help restore some of the beaches, sandbars and humpback chub fish harmed by Glen Canyon Dam. Non-residents who illegally kill fish and wildlife in Montana face stiffer penalties than locals who commit the same crimes. Intense opposition from ranchers and others may settle a federal proposal to reintroduce the endangered Mexican wolf to Arizona and New Mexico. Washington, D.C.'s budget impasse throws BLM offices throughout the West into turmoil. Former New Mexico State Engineer Eluid Martinez will replace Dan Beard as commissioner of the Bureau of Reclamation. A longtime effort to restore bighorn sheep to Hells Canyon is imperiled by a deadly outbreak of the disease pasturella. Idaho Fish and Game officials urge the Forest Service to remove logging roads damaged by heavy rain and landslides in national forests. Usually conservative residents of Noxon, Mont., react angrily to ASARCO's plan to build a huge mine in the Cabinet Mountains - and wish the federal government would intervene and stop it. We get it, does Fergus?